Two are better than one because they have a good return for their labor. For if either of them falls, the one will lift up his companion. 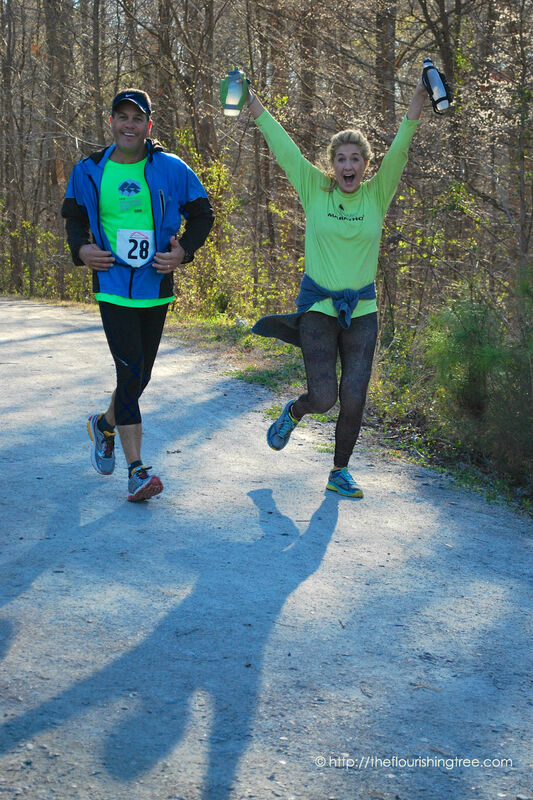 Three weekends ago, my husband and I were back in North Carolina as volunteers for the Umstead 100 Mile Endurance Run. The phrase “It takes a village” comes to mind when I think of this race, and though I’m not sure, I suspect there are at least as many, if not more, volunteers as runners who come out for this race. One of my “jobs” for the race was to take photographs of the runners, something I enjoy very much—much more than I would actually running 100 miles. It was a hard day to sit, though, or even stand in one place to take pictures. It was bitterly cold, even after the sun came out. We knew it would be cold and brought winter gear that had gone unused here in California; so I triple-layered my clothes that morning and slid into a sleeping bag before sitting down. The cold seeped in, despite my efforts to fight it. I suppose I could blame California for already wiping out my cold tolerance, but I suspect I would have been cold anyway. I fretted for the runners’ struggle during the run, sweating and warm from running but then getting chilled from the unwelcome wind. I cheered as they rounded the corner toward me, mostly to lift their spirits but also to draw out smiles when I could. Many of them smiled and cheered right back, grateful for someone sitting out there to capture their big day. A few were concerned about my warmth and safety, but I assured them I would be okay. One said to me as he passed by a second or third time (it’s a 12.5 mile loop course the runners run eight times), “Oh, good. They’ve gotten you a blanket.” I guess he was just noticing the sleeping bag. I wondered who “they” were and whether “they” would bring me something hot to drink. He seemed genuinely relieved to see that I might not freeze to death with the camera in my hand. Not everyone smiled, some too caught up in the act of running or the desire to compete well, but I began to pick out favorites whose own enthusiasm and energy kept me going throughout the day. The woman in the cat hat has gold wings on her feet! When the race is long, wearing something fun and running together can make the miles pass more easily. When this trio rounded the corner, the man in orange gloves called out to me and said, “On the count of three, we’re all going to jump. Are you ready?” He did a slow count to make sure I was ready, and I snapped this shot. Then he ran around behind me and had me check to make sure I had captured the moment. I laughed when the woman told them, “I didn’t jump.” They were less energetic the next time through but still had their senses of humor intact. A dear friend of mine came and rescued me at lunchtime. We headed off to Panera for soup and hot tea. That’s when it hit me, the feeling I get anytime I leave an ultra and head back into the “real” world temporarily. I begin to wonder at the number of people out doing their typical Saturday afternoon thing while something amazing is happening not far from them. You’re missing the amazing thing! I want to tell them all. There are runners out in the woods accomplishing this awe-inspiring run, and you’re missing it! Why are any of you here at Panera when this unreal thing is happening in the woods just minutes away? I don’t even really know how to explain this feeling I get, but it happens every single time my husband runs an ultra that I go watch or every ultra where we volunteer. The fact that Panera or the shopping centers are even open, much less full, messes with my equilibrium somehow. When I got back and resumed taking pictures, the realness of the runners’ efforts settled back in. I know Panera and the park and the lives in both places are equally real, but what was happening on the trail that day felt simultaneously surreal, unreal and realer than any other thing going on that day. 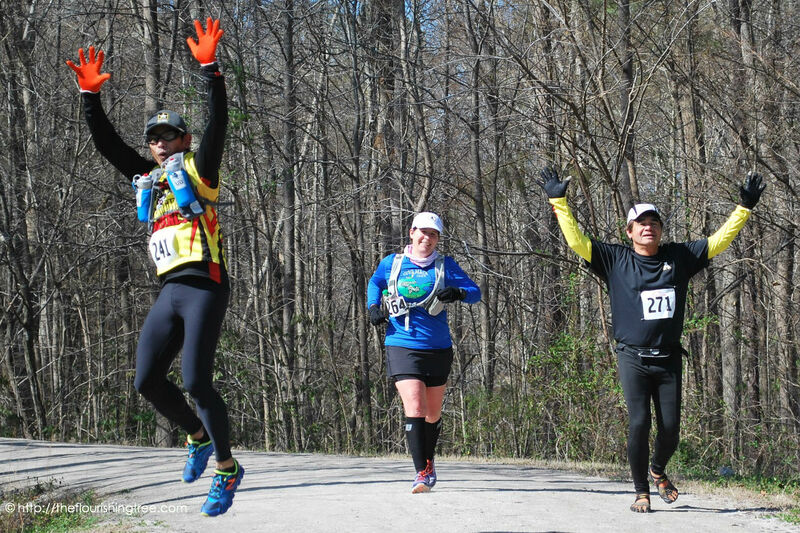 It’s as though my mind whirs at a different speed during an ultra, my hyper-focused self shuts out the rest of the world to bask in the race and to cheer on the runners. The emotions can get pretty real and raw out here at the race, too. One woman said, “I don’t think I’ll be able to smile the next time around.” I told her she wouldn’t have to for me, because I was getting ready to leave. These two runners stopped to embrace several times before the aid station. Only they know what running together had meant to the two of them and what the thought of running separately after this point might mean. For some, there would be tears and disappointments, injuries too painful to ignore, motivations blown away in the bitter wind. But for plenty of runners, there would still be moments of levity, laughter and joy. In the last couple of hours before sunset, I began seeing runners come through with their pacers (something they can do after 6 p.m. or after they hit the 50-mile mark, whichever comes first). A pacer can make all the difference between a runner finishing or dropping out because the pacer brings fresh legs, a clear mind, energy, and conversation to accompany and encourage the runner. The photo below speaks to the invaluable presence of a pacer (and also reminded me of Ecclesiastes 4:9): Two are better than one. And sometimes, a third person with a camera helps, too. 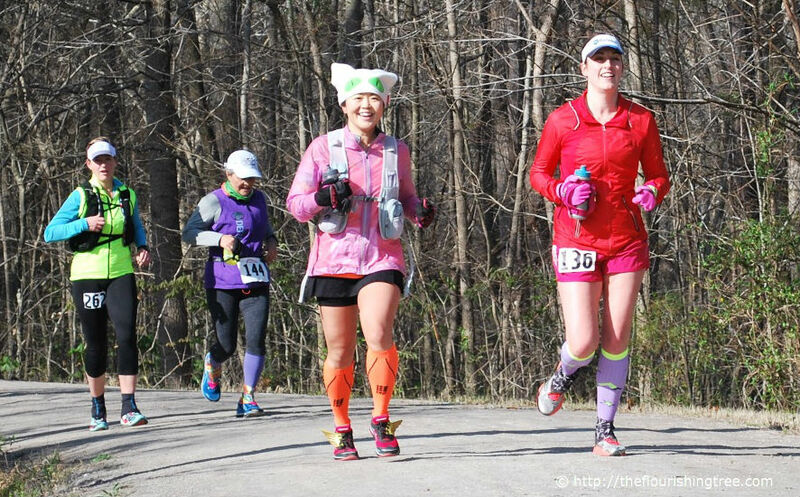 This past Saturday, friends of ours ran a marathon in the mountains. My husband—complete with cow bell and safety vest—volunteered to direct runners (and traffic) at one of the turns in the race. I was in full spectator mode and watched the race from three different spots along the course. Not all of what I saw thrilled me: for one, the driver of the SUV who blew past my husband and sped toward runners who were in the process of crossing the road to make a turn in the course. While many races close their courses to vehicular traffic, this particular race does not. It begins on a track and ends on another track, but in between, on curvy mountain roads, there are few places where vehicles aren’t allowed. Signs alert drivers to be aware of runners on the road. And many drivers are more cautious, move over to give runners room, and/or drive slower as they pass the runners. There are a few, though, who don’t give a rip. 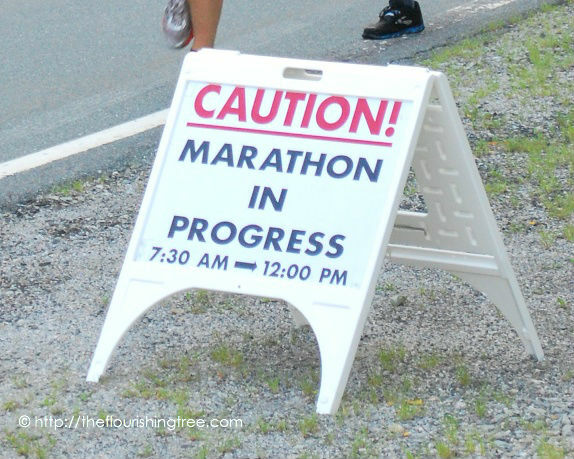 The marathon course includes parts of the Blue Ridge Parkway, and because it cannot be closed during the race, park rangers step up patrols along the part where runners will be. Volunteers at the turns remind runners to run facing traffic, and for the most part, the runners heed these instructions. But there are some places along the course where the runners have to cross over, dodging cars that could be coming from either direction. The SUV driver was coming from a direction where she would not yet have encountered runners in the road, but she would have passed caution signs warning of runners ahead. She had not been inconvenienced on her route up until the point where my husband stood in the middle of the road. She would have had to slow down for just four miles (a place where the speed limit is between 35 and 45 anyway), not an onerous amount of time to spend being decent to other human beings. She chose not to be inconvenienced, though. Who cared if these runners were tired? Who cared if they were in a zone and not as alert to their surroundings as they might usually be? Who cared if a car zipped by them too closely and too quickly? She clearly didn’t care. As drivers, we may find it easy to ignore the fact that actual, live human beings are driving and riding in the cars around us. It’s too easy to dehumanize the other drivers around us. And I’m beginning to wonder if the same isn’t happening with some drivers’ (lack of) regard for cyclists and runners. Other “objects” out on the road are simply obstacles to be dodged, like some great big real-world video game. Except that they’re not just objects, and you can’t earn more points by getting through the course faster or more recklessly. They’re humans. And the ones who aren’t in cars are more vulnerable. When my friend saw this picture, he told me he had no recollection of running by a tractor. The tractor driver was courteous and safe and, therefore, deserving of a gold star. Running has changed the way I drive and the way I perceive others out on the road, especially runners and cyclists. I have experienced moments in my running when I was so tired I knew I had to be extra careful with traffic. My mental reaction time had slowed because my brain was so focused on the running. When I’m running, my rule is this: never assume the driver sees me. And now when I’m driving: never assume the runner sees me. Humans have a great capacity for kindness. We have an equally great capacity for being jerks. I’ve seen runners stop during a race to help a fallen runner. I’ve seen runners treat other runners rudely in the way they hog a trail or cut others off at a turn. I’ve seen cyclists stop to let runners pass safely through an intersection, and I’ve seen cyclists completely ignore runners, cars, other cyclists and stop signs so they won’t have to slow down. We’re free to drive/cycle/run recklessly, but we’re also free to drive/cycle/run considerately (and only one of those deserves a ticket from the park ranger). We’re free to be kind, or we’re free to be insensitive. It’s up to each individual. I just wish more would choose the path of kindness and common decency. Like it or not, we’re all in this together. I’m a southern girl living in a growing city. When I go out for a run in the morning, I know at least half of the runners I pass will greet me in some way. A nod or a wave, a “hello” or “mornin'” (we mostly drop that last -g around here). I know a handful of cars will stop to let me cross roads, a few more will even move over to give me room to run along the shoulder, but I know that most cars’ drivers will not even notice me. On my weekend runs, if I meet a Galloway group, I’ll hear a chorus of “Runner up! Runner up! Runner up!” trickle down the line of runners as we go by so the runners in back will move over to allow me room to run by. If I’m overtaking them, I’ll hear, “Runner back!” This practice amuses my husband, and he says it reminds him of the quacking of a mother duck and her line of ducklings. In addition to being amusing, it’s also really darn considerate. What’s the running culture like where you live? Do runners greet each other and how? With a verbal greeting? A wave or maybe a thumb’s up? I ask you these questions because I’m still pondering different running cultures after a week’s vacation in New England. My husband and I visited three New England states and talked with each other about the different reactions we got while we were out running. The first few days of our trip, we were in a coastal town with an asphalt path running along the edge of ocean cliffs. Our waves and “good mornings” were largely greeted with blank stares or stony silence. Some of the walkers and runners we passed seemed perplexed to hear our voices. A handful of folks we passed would respond in kind, but they were definitely the exception (and to be honest, we started to wonder if they were also visitors). I met a Galloway group that Saturday morning running along the cliff path in the opposite direction from me, and instead of the usual “Runner up!” I hoped to hear, all I heard was the pounding of feet. Were they on some sort of death march that they could not acknowledge a fellow runner? I’ll admit it: they made me homesick. (In fairness, they may have preferred I stay home or at least stay off “their” path.) I passed them a second time on the way back to the beginning of the trail. Same silence. Cars were kinder in this town, though, and even though not all stopped for me as I waited at a crosswalk, there were more who stopped for me than would have at a crosswalk in my own city. I waved as I crossed, probably branding myself as a tourist. My husband and I stayed just outside of Boston proper for the next leg of our trip. Again, a few confused stares at our greetings, but I also had what almost qualified as a conversation with one runner (a sudden sound of rushing water had startled us both as we turned to the source thinking “Large animal?” It turned out to be a large drain dumping water into the river, and we laughed at our own jumpiness and wished each other a good run.). The few more responses I got made the run feel less lonely. The community of runners may simply be more bonded together in Boston because of Boston’s history with running, and so running camaraderie may be more welcomed or expected there. In the final days of our trip, we headed north and stayed in a small town that boasts a national park and brushes up to the Appalachian Trail. I’ll admit that my sample size was pretty small on my run here, but the folks I passed mostly just gave me sideways glances as I ran by and called out “hello.” One woman with a dog smiled as I went by. As my husband and I walked around the town later that day, we met an extremely friendly couple whose automatic garage door we stopped to admire/gawk at (it opened out instead of up!). We chatted for several minutes with them about the garage doors, the town and its must-sees, our own city. Their warmth took some of the sting out of my silent encounters on the morning’s run. The next day, I was chatting with a doorman at the hotel while my husband went to get our car. He asked where I was from. I asked if he was from there. He said, “No, I’m from Mass.” He paused and then said, “It’s pretty much the same, though.” I was skeptical and told him so. He replied more honestly then. “No, the culture’s pretty different here.” I wondered if his initial response is just something he tells all the southern ladies so we go back with our stereotypes of New England intact. I wanted to tell him that the running culture is different there, too. How about where you live? Whether you’re out running or walking, do you greet the others you see? If I were to visit and passed you on a morning run, would you call out a greeting to me? If you come to my city, I’ll be sure to wave or say hi. Well, unless I’m going up a steep hill. Then you may just have to settle for a slight nod. Yesterday marked the one-year anniversary of the bombings during the Boston Marathon, and media coverage has taken over with stories positive, hard, sad, inspiring, uplifting. I’ve struggled to contain my emotions this week as story after story describe individuals’ lives a year after two terrorists decided not to wait any longer to launch an attack on the city and on my tribe, my family of runners. On Monday, runners will line up again in Hopkinton, bibs pinned on, shoes laced up, ready to run toward the painted finish line on Boylston Street. The finish line last year. It got a new coat of paint for this year’s race. I love that this year’s race is the day after Easter, when we celebrate Christ’s ultimate sacrifice and victory over death through His resurrection. In many ways, regardless of faith, those who participate in the Boston Marathon on Monday are Easter people, too, celebrating resurrection: of a city’s pride, of a running community that would not let evil overcome it, of the human spirit that would not cave to fear and tragedy. Please be with the runners at Boston this year, both those I know and those I’ll never meet. Give them strength of body and mind as they take on this challenging course. Please also be with the police and medical crews who will protect the runners. Give them patience, wisdom and discernment as they do their work. Please also be with the race organizers and volunteers. Give them the ability to provide the runners with a wonderful, renewing experience. Please also be with the spectators who will cheer for the runners as they speed by. Replace any misgivings or anger or fear with joy and unity and a sense of jubilation. And, God, please be with those who cannot be at the race but long for the courage or the speed or the healing that would enable them to attend. Please send comfort to those who mourn a loss of life or limb and with those who are trying to navigate a “new” normal. Please heal both the physical and emotional wounds of those traumatized by last year’s events. Please cover the entire course with Your protection, and turn away all who are intent on causing terror or spreading evil and chaos. I especially lift up the Hoyts to You, as they make their final Boston Marathon run together. May it be an occasion of joy and blessing for them after so many years of showing what a father’s love can mean in the life of a disabled son. 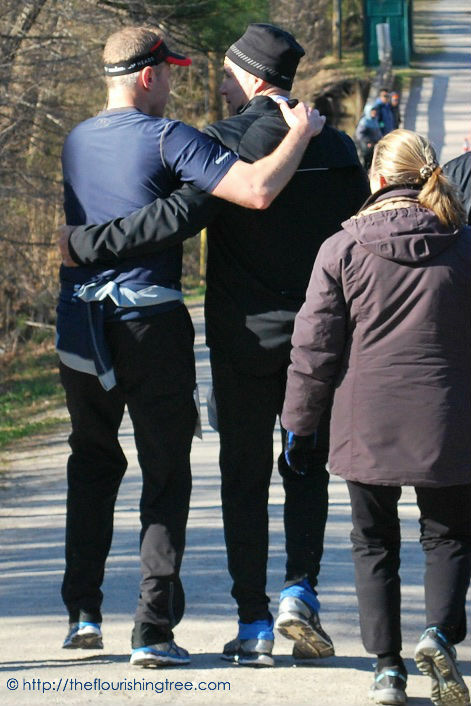 I also lift up Scott Menzies and the other family and friends running in memory of Scott’s wife Meg. Please let them sense Your healing presence as they race where she had hoped to run. Please let the memorial for her near the 1-mile mark remind all who pass by to treasure their time here, to delight in life and to be kind to one another (and maybe also not to drive drunk or distracted). Please send a gentle breeze – and if it’s in Your will, please let it be a tailwind, however rare for this marathon – and a perfect temperature for running. Please energize tired legs and mend broken hearts even as runners climb Heartbreak Hill. Please, most of all, let good triumph on Monday. It is in Your son Jesus’ name that I make this prayer. Amen. If you have family or friends (runners or spectators) heading to Boston and would like for me to pray for them by name on Monday during the race, it would be my privilege to do that for you. Please feel free to leave names and prayer requests in the comment section below. For now, I’ll leave you with this Boston Marathon story featuring the Hoyts, an inspiring father-and-son duo who will run their final Boston Marathon together on Monday. I’m a running purist. No color runs (runs where you get doused with bright colors of paint) or tough mudders (think of obstacle courses and mud with some running thrown in) for me. But if that’s your thing, hey, that’s cool with me. 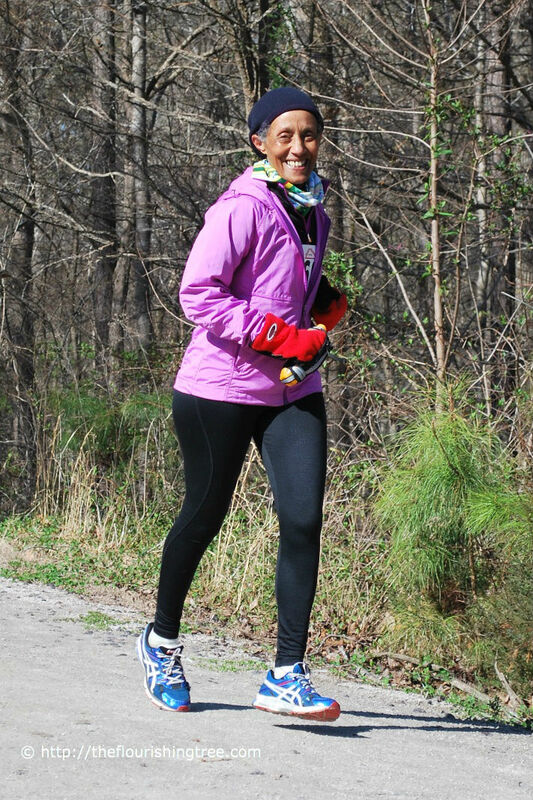 I also don’t like to wear costumes when I run, if for no other reason than I like to run without distractions of extra-warm or too-itchy clothes. 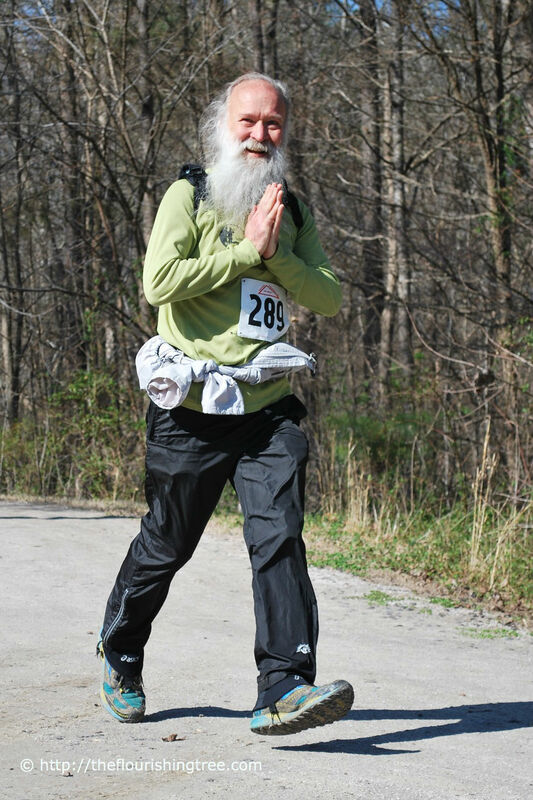 But I’ll admit that I enjoy seeing the fun ways other runners express themselves with what they wear. Some runners wear shirts with inspiring messages. Some runners wear funny socks up to their knees. Some runners wear stuffed turkeys or reindeer antlers on their heads when a race celebrates a particular holiday. Some runners wear tutus. My husband took this picture at my first 10K several years ago, the Flora Women’s Mini Marathon in Dublin, Ireland. It was great fun, in part because of women in tutus and other fun costumes celebrating the day together. Costumes can make running fun – a good kind of silly – and can distract other runners from the pain or negative thoughts that creep in during a race. As I think back over the races I’ve run, the toughest ones always had moments of awesomeness because of what another runner was wearing. Wearing something that makes other runners smile at a rough point in the course or encourages spectators to cheer louder? Well, that’s a gift. So when the social media world exploded last week with news of Self magazine mocking two women wearing tutus during a race, I paid a lot of attention – even more when I learned that one of the runners in the photo was fighting cancer, that both women coach Girls on the Run (GOTR), and that they make and sell tutus to raise money for their local GOTR chapter. These are my people, and a national magazine mocked them? Here’s a quick summary: Self magazine published a photo of two women wearing tutus and race bibs to accompany a short piece mocking runners who wear tutus, calling it “lame.” Social media lit up with fury. The magazine back-pedaled, apologized and has scrapped the snarky column moving forward. To see what else has come of this story, watch this great interview with Monika Allen (the runner fighting incurable cancer) with Katie Couric from yesterday’s show. In the photo, Allen is dressed like Wonder Woman and her friend like Supergirl, and if you look closely, you can see that her friend’s race bibs says, “Die tumor die.” If the editors at Self had looked closely, they might have prevented the firestorm they brought on themselves. Allen was running the LA Marathon that day, her first marathon since a brain cancer diagnosis several months earlier, and she dressed like Wonder Woman in a tutu to lift her own spirits and to bring joy to others. The marathon was Allen’s 19th and her slowest, but she ran it and triumphed in more ways than simply completing a marathon. She’s bringing national attention to the ways we tear each other down instead of building each other up. And she’s doing it with grace and kindness and energy while she faces a fight with cancer that she may never win. Self wanted its readers to judge her for her tutu, to make themselves feel better because they would never wear tutus while running. The magazine apologized because Allen has cancer. But would they have apologized if she hadn’t been fighting a disease, if instead, she had simply been a healthy, beautiful woman who wanted to have fun during a hard race? They misjudged her because she wore a tutu. They didn’t count on her also being strong and poised and intelligent and willing to speak out for what is right. Like Allen and her friend, I coach young girls who delight in wearing tutus and are just learning to associate running with joy and fun. They’re also learning to examine how media portrays women (and men, too) and how to stand up to bullies. The magazine has given GOTR chapters all over the country an easy way to discuss these topics. But what pains me is that there will continue to be plenty of other examples of the media making fun in poor taste, of tearing others down, of trying to stereotype based on appearance, of crushing self esteem to make a buck. When do we say, “Enough”? The conversation will continue, and Monika Allen’s role in the conversation has, at least briefly, turned it in a positive direction. Maybe by the time the girls she and I coach reach adulthood, we’ll all be a lot farther down a better road. Be sure of this: If they’re wearing tutus on that road, it would be a mistake to judge them.